LIMES project is a form of dialogical art, community art, for the first time performed in Serbia by Theater Mimart. Performed in non-theatre space, in the building Old City where were participants in workshop. Developing creativity of citizens by applying theatrical methods in an open process during two months of workshops, resulting in a performance with artists. Aim of project is the Impact of Culture and Creative Art on Community Cohesion. 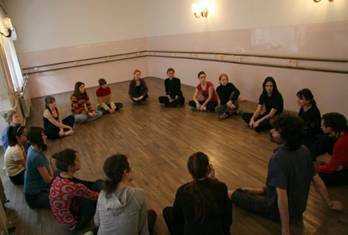 The concept of the project with citizens LIMES created by Nela Antonovi according to the method Mimart, which directed performance together with collaborators, coauthors of performance seven groups of citizens in various areas. Citizens have gone through the creative process of creating performance. Collaborators/ Coauthors: Lidija Antonovic, Nikola Vranic, Predrag Radovancevic, Dubravka Subotic, Sladjana Savic, Ana Bastac, Marjam Ristic i Ivan Milenkovic. BITEF, Bitef Polifony, September 2010. "Through the very active participation of audience in the play (they were disciplined move in a labyrinth of rooms which are guided) gradually expanded range of desires, and capabilities of each performer, MIMART professionals and amateurs, who have won audience with the same energy...All performers are obviously very seriously prepared for this joint appearance through numerous workshops, which have contributed to the opening of their personal spiritual and physical skill in the theatrical expression, as with the educational value is priceless.